I'm excited to share that I am once again participating in Progressive Eats; a monthly online progressive dinner. This month's theme is Valentine's Day food! You can see what the group is cooking by stopping by all the blogs in the list below. Between you and me my husband and I don't typically celebrate Valentine's Day. That being said I'm not opposed to cooking a special meal for my sweetheart now and again. That's where this winning dinner of steak & eggs comes in. Rich and uncomplicated this is guaranteed to impress your significant other on Valetine's Day or any day. A few hours before you plan on cooking your steak, place each rib-eye into a plastic bag along with the olive oil, rosemary, thyme and garlic. Shake the bags to coat the steaks and refrigerate until ready to cook. Remove the steaks from the refrigerator about 30 minutes before cooking. Heat a grill pan over medium-high heat. Season the steaks with salt & pepper. Place the steaks on the pan and sear for 5 minutes without moving the steak itself. Flip each steak and repeat on the other side. Remove the steaks and place on a baking sheet. Bake in the oven for 7-10 minutes depending on preferred doneness. Allow the steaks to rest while you cook the eggs. Meanwhile, in a small bowl mix together the lemon zest, lemon juice, olive oil, rosemary, thyme. Toss with the arugula and set on a serving plate. Heat a small nonstick skillet over medium heat. Add olive oil and slide in the egg, being careful not to break the yolk. Season with salt and pepper. Reduce the heat to medium-low and gently cook the eggs until the whites are set and the yolks are still soft, about 3 minutes. Transfer the steaks to the serving plate with the arugula. Place an egg, sunny-side up, on each steak and serve. This would be a dream dinner for my hubby! Perfect way to make his Valentine's Day dinner delicious and memorable!! I'm the one in our family who loves sunny side up eggs on everything. So while I might make this dish, probably will be for me and not my honey. I love the concept of steak and eggs, though I'll admit I've never actually had it. Hmmm ... maybe now is my time. Now this is my version of a real breakfast! Love the bone in. The arugula. Everything! This is such a presentable dish. Will have to make it as soon as possible! Thank you for sharing! I'll be honest, for many years I was meh about steak and then I happened on the perfect ribeye and everything changed. I am just imagining that beautiful piece of rare meat with egg yolk and I'm in heaven. Sounds totally divine! 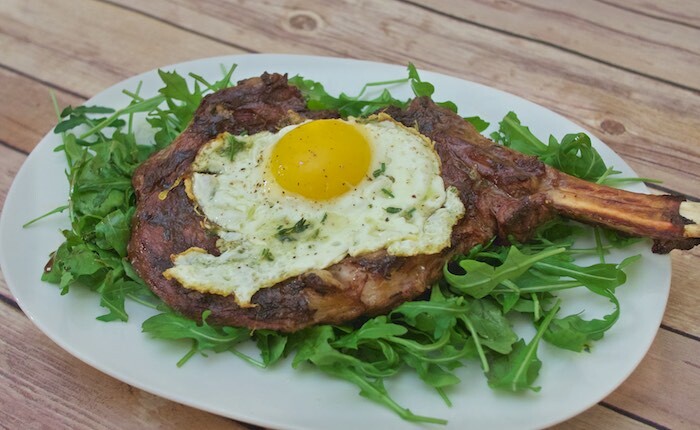 Steak and Eggs in a whole new way! I thought I left a comment last night! I love to #putaneggonit !!! Arugula and steak is a great vehicle for a runny yolk! Ooh that steak! I agree with Barb.. the right cut of meat cooked to perfection is a game changer! This IS a game changer! This would be good right now. THIS RIGHT HERE is a part of my life! MEAT with a poached/sunnyside up/runny egg - YES and more YES!!!!! Egg Yolk is all I need in terms of a "dressing"!!! :) I am soooo game for this dish! What a lovely presentation... I just love greens with steak! The egg is the perfect addition, too! SO delicious! Now this is my kind of meal!!! lovely post dear this post is surely making me hungry keep posting..